She placed her baby in the ark. HE CHILDREN OF Israel stayed in the land of Egypt much longer than they had expected to stay. They were in that land about four hundred years. And the going down to Egypt proved a great blessing to them. It saved their lives during the years of famine and need. After the years of need were over, they found the soil in the land of Goshen, that part of Egypt where they were living, very rich, so that they could gather three or four crops every year. Then, too, the sons of Israel, before they came to Egypt, had begun to marry the women in the land of Canaan who worshipped idols, and not the Lord. If they had stayed there, their children would have grown up like the people around them and soon would have lost all knowledge of God. But in Goshen they lived alone and apart from the people of Egypt. They worshipped the Lord God, and were kept away from the idols of Egypt. And in that land, as the years went on, from being seventy people, they grew in number until they became a great multitude. Each of the twelve sons of Jacob was the father of a tribe, and Joseph was the father of two tribes, named after his two sons, Ephraim and Manasseh. As long as Joseph lived, and for some time after, the people of Israel were treated kindly by the Egyptians, out of their love for Joseph, who had saved Egypt from suffering by famine. But after a long time another king began to rule over Egypt, who cared nothing for Joseph or Joseph's people. He saw that the Israelites (as the children of Israel were called) were very many, and he feared that they would soon become greater in number and in power than the Egyptians. He said to his people: "Let us rule these Israelites more strictly. They are growing too strong." Then they set harsh rules over the Israelites, and laid heavy burdens on them. They made the Israelites work hard for the Egyptians, and build cities for them, and give to the Egyptians a large part of the crops from their fields. They set them at work in making brick and in building storehouses. They were so afraid that the Israelites would grow in number that they gave orders to kill all the little boys that were born to the Israelites; though their little girls might be allowed to live. But in the face of all this hate, and wrong, and cruelty, the people of Israel were growing in number, and becoming greater and greater. At this time, when the wrongs of the Israelites were the greatest, and when their little children were being killed, one little boy was born. He was such a lovely child that his mother kept him hid, so that the enemies did not find him. When she could no longer hide him, she formed a plan to save his life; believing that God would help her and save her beautiful little boy. She made a little box like a boat and covered it with something that would not let the water into it. Such a boat as this covered over was called "an ark." She knew that at certain times the daughter of king Pharaoh--all the kings of Egypt were called Pharaoh, for Pharaoh means a king--would come down to the river for a bath. 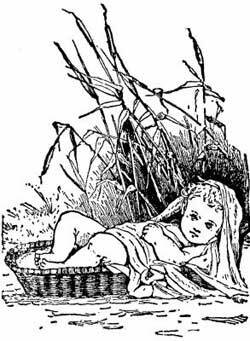 She placed her baby boy in the ark, and let it float down the river where the princess, Pharaoh's daughter, would see it. And she sent her own daughter, a little girl named Miriam, twelve years old, to watch close at hand. How anxious the mother and the sister were as they saw the little ark floating away from them on the river! Pharaoh's daughter, with her maids, came down to the river, and they saw the ark floating on the water, among the reeds. She sent one of her maids to bring it to her so that she might see what was in the curious box. They opened it, and there was a beautiful little baby, who began to cry to be taken up. The princess felt kind toward the little one, and loved it at once. She said: "This is one of the Hebrews' children." You have heard how the children of Israel came to be called Hebrews. Pharaoh's daughter thought that it would be cruel to let such a lovely baby as this die out on the water. And just then a little girl came running up to her, as if by accident, and she looked at the baby also, and she said: "Shall I go and find some woman of the Hebrews to be a nurse to the child for you and take care of it?" "Yes," said the princess. "Go and find a nurse for me." The little girl--who was Miriam, the baby's sister--ran as quickly as she could and brought the baby's own mother to the princess. Miriam showed in this act that she was a wise and thoughtful little girl. The princess said to the little baby's mother: "Take this child to your home and nurse it for me, and I will pay you wages for it." How glad the Hebrew mother was to take her child home! No one could harm her boy now, for he was protected by the princess of Egypt, the daughter of the king. When the child was large enough to leave his mother Pharaoh's daughter took him into her own house in the palace. She named him "Moses," a word that means "drawn out," because he was drawn out of the water. So Moses, the Hebrew boy, lived in the palace among the nobles of the land, as the son of the princess. There he learned much more than he could have learned among his own people; for there were very wise teachers. Moses gained all the knowledge that the Egyptians had to give. There in the court of the cruel king who had made slaves of the Israelites, God's people, was growing up our Israelite boy who should at some time set his people free! Although Moses grew up among the Egyptians, and gained their learning, he loved his own people. They were poor and were hated, and were slaves, but he loved them, because they were the people who served the Lord God, while the Egyptians worshipped idols and animals. Strange it was that so wise a people as these should bow down and pray to an ox, or to a cat, or to a snake, as did the Egyptians. When Moses became a man, he went among his own people, leaving the riches and ease that he might have enjoyed among the Egyptians. He felt a call from God to lift up the Israelites and set them free. But at that time he found that he could do nothing to help them. They would not let him lead them, and as the king of Egypt had now become his enemy, Moses went away from Egypt into a country in Arabia, called Midian. He was sitting by a well, in that land, tired from his long journey, when he saw some young women come to draw water for their flocks of sheep. But some rough men came, and drove the women away, and took the water for their own flocks. Moses saw it, and helped the women and drew the water for them. These young women were sisters, the daughters of a man named Jethro, who was a priest in the land of Midian. He asked Moses to live with him, and to help him in the care of his flocks. Moses stayed with Jethro and married one of his daughters. So from being a prince in the king's palace in Egypt, Moses became a shepherd in the wilderness of Midian. But Moses did not remain a shepherd. While he was tending his sheep God appeared to him in a burning bush and told him that he should return to Egypt and become the leader of his people. The Lord told him that the wicked Egyptians would be punished for the ill-treatment they were giving the Israelites. In your Bible you will find in the book of Exodus how God wonderfully fulfilled his promise. The Egyptians were punished by many plagues, and finally allowed the Israelites to go. They crossed the Red Sea in a wonderful way, and traveled for a long time through a wilderness, where God fed them day by day with manna from heaven. God also gave them rules as a guide for their daily living; these rules we call the Ten Commandments; yet they forgot the Lord so far as to make images and worship them.